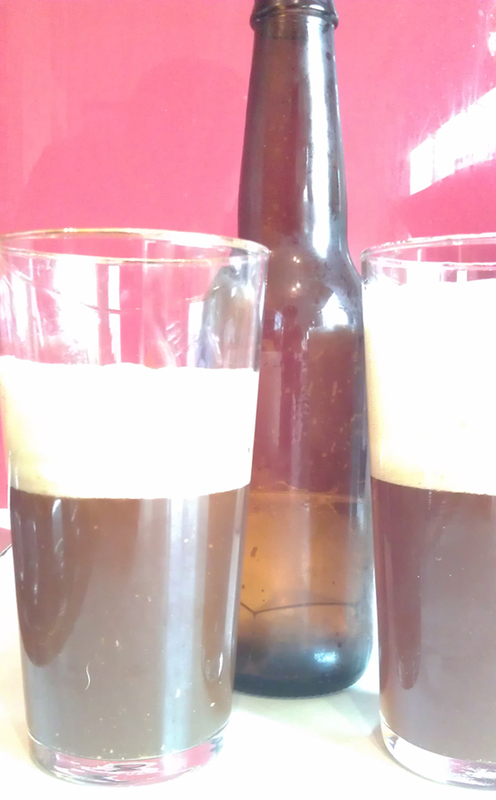 As Chas mentioned a few days ago, on the weekend we did a brew of an IPA. Chas will be posting the write up on that sometime soon. As part of any good brew day there are tastings of recent brews. One of those was the previous IPA, and a double IPA, The Beagle. This is a very big IPA, which is what you would expect from a double. There’s plenty of hops across the board. Big round orange fruit aroma from the Amarillo hops. There’s a lasting and solid body as the back bone for this beer. The body is sort of a sweet caramel amber style. The bitterness is quite strong and full across the length of the beer. Initial hops are large and quite a hit. After a couple mouthfuls you get use to it and the tasty hop flavours come out quite a bit. About mid way into the beer the bitterness really kicks up a notch. And overall the bitterness is almost too much. The strong sweetness balances it a bit and saves this from being too crazy to enjoy. With a couple minor tweaks this could become an amazing beer. Really good beer over all. It does demands your attention and you can’t try to do much else, not that it’s a bad thing. Sit down, shut up and enjoy. Food? Nah, don’t bother trying to match anything with this. Okay, if I was pushed to find something then I might suggest something strong and salty like BBQ pork. Mikey, a fine drop one would think Quote -With a couple minor tweaks this could become an amazing beer. What tweaks would you consider next time.? Mark, thanks for the comment. I’ve been looking at the recipe and thinking about the review. The beer came out swinging with a few big blows. The hops might benefit from a better balance, I really don’t know a huge amount about different hops. There was a home brew I had where they used a blend of hops at the taste and aroma stage. This might help keep the beer a bit balanced. The other option I would try is reduce the amount of bittering hops. I know this is meant to be a double IPA but the bitterness did get to be too much. Originally I thought that changing the malt or grains a bit might help. After some more time review this, I think the body was good and I wouldn’t change the grains used.